Agents of S.H.I.E.L.D. kicked off season three much in the same way they began season two: with a whole lot of world-building and exposition. Dealing with the aftermath of the terrigen-laced fish oil capsules being released to the public, the stakes feel more super-powered than ever. S.H.I.E.L.D. is busy searching for newly-minted Inhumans, trying to take them into custody before the mysterious ATCU can get to them. 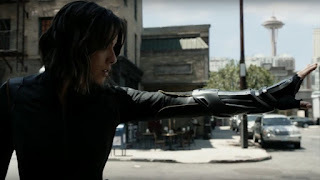 The team is struggling after Jemma's absorption into the monolith, and Coulson is adjusting to life without his literal and figurative right hand, as Agent May decided not to return from her vacation. Gone are the days of a show about a ragtag band of misfits. The team now resembles the S.H.I.E.L.D. from earlier Marvel movies: cool gadgets, jets, and all the firepower you could want. The opening high tech extraction mission featured Daisy's superpowers and improved special effects. The VFX were impressive, but threatened to overpower what was going on with the actual characters at any given time. Skye has fully evolved into Daisy Johnson, and it's an appropriate final transformation for her character. We've seen her turn into a capable agent, fighter, and now, as a fully developed superhero, she is in her element. She’s in the field searching for other Inhumans, and ultimately found the Secret Warriors. I was surprised to see Mack as her partner (though at this point who else could it be with May gone and Bobbi still in rehab?) but I liked the pairing. The two actors have an easy chemistry, and Mack is quickly becoming one of my favorites. That chemistry is something I find lacking in Lincoln. His rejection of Daisy and his new found hatred of powers feel inauthentic and pointless. We know he will inevitably join the Secret Warriors project, so his running away after Lash's (terrifying) appearance is just a stall tactic. Lincoln was clearly added as a love interest for Daisy, but I don't find him that believable -- or interesting -- a character. An equally uninteresting couple is Bobbi and Hunter, who seem to have made up... to the surprise of no one anywhere. Fitz is the runner-up to Daisy's "Nothing Like The Pilot" award. Recovered from his brain damage and now a super spy in his own right, we find him running a dangerous solo mission to try and rescue Simmons from the Monolith. Ward would be so proud of how far he's come... if we saw Ward at all. His swagger was noticeably absent from the season premiere, as he is presumably off rebuilding HYRDA into his personal army. The addition of Constance Zimmer as Rosalind Price was a welcome one. Zimmer and Gregg are well-matched, and watching these two spar was the highlight of the episode. It's unclear if Rosalind will be friend or foe but she seems more then capable of keeping Coulson on his toes. Overall, this episode set up some interesting themes to examine throughout the season, but stumbled in its overstuffed attempt to explain the various action and catch up with everyone. Still, the questions posed are intriguing. What universe is Simmons in? How can S.H.I.E.L.D. possibly keep up with the overwhelming amount of new Inhumans? Will Ward become a supervillain? We've got all season long to find out!